This interview with Ashok Jaiswal was conducted by Nathaniel Suen and condensed by Wayne Hann-Yuan Chang of EntrepreneurHK. EzeeCube is an internet-enabled wireless device that automatically syncs photos and videos from users’ smart device organizes them and remove duplicates. It is a stackable device equipped with massive storage, allowing users to store movies, music and contacts as well. Connected to the TV, EzeeCube serves as a media center for the family and a personal cloud device. 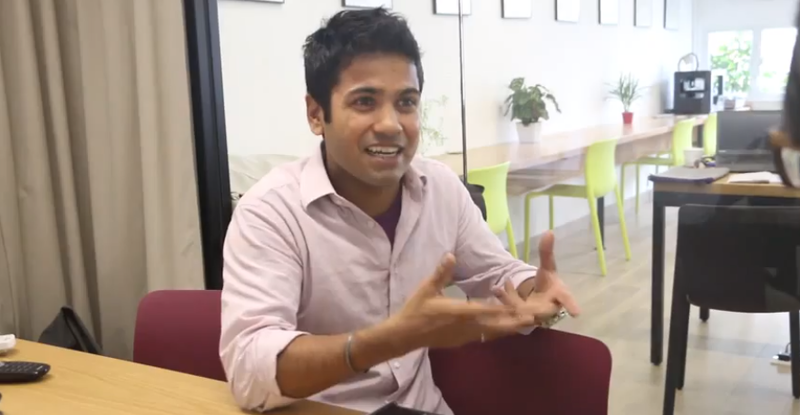 EntrepreneurHK (EHK) sits down with EzeeCube founder Ashok Jaiswal and have a chat about his hardware startup journey. What difficulties or problems will one encounter when building their hardware startup? Firstly, finding the talent; if as a founder yourself you do not know how to build hardware, it’s very difficult to find good engineers to build hardware for you. Secondly, the initial seed money that you need. While it doesn’t take much capital to establish pure app startups or software startups, in tech hardware startup the first prototype itself can cost you a lot of money. The third problem is the sources to even get the first prototype done. Even if you found an engineer and the money to build it, you have to find the right partners where you can take your technology and ask them to prototype it. The fourth problem is to actually taking the prototype to people, try selling it, and getting feedback. Unlike software which is downloadable, for hardware you have to actually give people the product. As a startup, you cannot have 500 units to send out to people to try it and improve your product; for us we only had one unit. The fifth problem is that once you have people interested in your product, how do you actually make the product and give it to them? The whole process of taking a prototype to production is a lengthy and expensive process; tons of money is required to build a few units for distribution. That is another major challenge, and we try to overcome this problem by crowdfunding. Also, I believe there will be the sixth challenge that will come after the concept stage and when going on to the product stage, where you have to market this product, either in retail or in any other manner. Then it’s the problem of scaling it, distribution of hardware, the fulfillment, and logistics. Do you find those challenges progressive? Are they getting more and more challenging? They are progressive in a sense that the nature of the challenges becomes different. At this stage where we have not delivered the product to people yet, the challenge is to make them trust us that we can deliver. Once we have delivered them, then the challenge will probably be more about keeping that trust, taking this good will we created now and capitalizing on it, and providing good support and logistics. These challenges do get bigger, and the nature of the challenges starts to change. Can you foresee the challenges you are going to face? To fulfill and capitalize on the good will we are trying to create right now through our Indiegogo campaign; continue to support the customers we already have. Reaching the right market, scaling the production, and making hardware production cheaper so that consumers benefit more. Also, since ours is an open source system, we want more and more people to build accessories for that, which could help and benefit more people. If you could start EzeeCube all over again, would you do it differently? It’d be better to have a founder member who is a hardware engineer─which I initially did not have. If someone who doesn’t have experience in hardware wants to build hardware, it is best to start from somebody who knows hardware. Without prior knowledge of hardware, learning to design hardware can be difficult. If you want the startup to be very nimble, probably do not make custom hardware; pick something off the shelf and work with that first. Can you give us the most important advice to hardware startups? The most important advice would be to do anything it takes to build one hackable unit ASAP─it doesn’t have to be perfect, but it has to be something that works─and get it out there to collect first-hand opinion from the consumers. Getting initial feedback from as many people as possible is another important thing to keep in mind. When we started EzeeCube, there were a lot of features we actually eliminated and added based on the people’s feedback. As a founder of a startup, you probably would have a lot of ideas because of the passion you have about the product. While some of the ideas relate strongly to you as a founder, they might not relate to the consumers as much. Reaching the right market is something every start-up should also look into. Remember to take those who aren’t that tech-savvy into account. Instead of going to places that only appeal to tech-savvy audience, you probably want to identify your target market first, reach out to them, get their opinions, and then later find the channel that will lead to them.